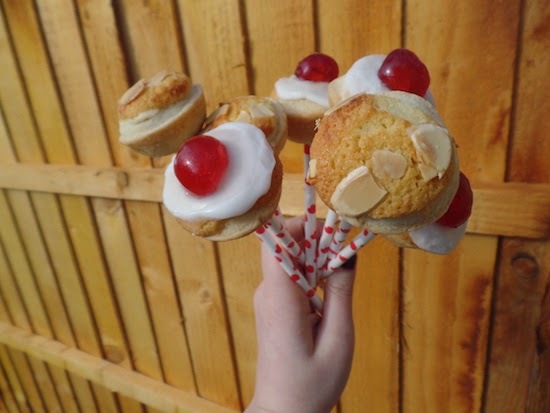 Emily's Recipes and Reviews | UK Food Blog | Leicestershire : bakewell tart pops. No surprises here - it's another Bakewell tart recipe! From macarons to pancakes and Easter inspired creations to filo pastry, I've now happened upon Bakewell tart pops. Inspired by the classic cake pop, with a frangipane twist, a layer of thick icing sugar and a cherry on top. Equipment; Mini tart tin tray, rolling pin, small round cutter, cake pop sticks. I got my 24 tart tin and cake pop sticks from eBay, and used my small ravioli press for the cutter. This was found at TK Maxx and is just slightly bigger than the tin size. Step one. Roll out the pastry on a floured surface and cut out 12 small circles. Place in your tart tin. I didn't pre-grease as this one was non stick. Step two. Mix together the butter, caster sugar, egg and ground almonds until combined. Step three. Add a teaspoon of raspberry jam to each tart case. Step four. On top, add the frangipane mix. Scatter with flaked almonds if you wish. As you can see I did half flaked almonds half icing sugar. Step five. Bake for 18-20 minutes until golden and cooked through. Allow to slightly cool before removing from the tin. 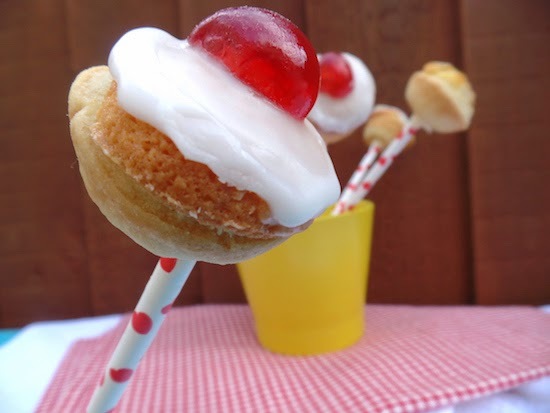 Whilst still warm, use a cake pop stick to pierce a hole in the underneath of the Bakewell. My 12 worked no problem,but you could try a skewer too. Step six. Mix the icing sugar with the tiniest drop of water at a time, keeping the icing super thick. Cut your glace cherries in half ready for placing on top whilst the icing is still wet. Step seven. Dollop a very small amount of icing on the top of the Bakewell and allow to naturally run down. Place half a cherry on top. Repeat and allow to set for around 20 minutes. Step eight. Heat up the white chocolate on a very low heat until melted. Step nine. Dip the cake pop stick in the white chocolate and then push into the underneath of the Bakewell tart and hold for 30 seconds. Set aside safely to completely dry. Have you made any Bakewell recipes with a twist? Would you prefer the flaked almond topping or icing sugar with cherry on top? If you liked this, you may like my Bakewell macarons, cherry Bakewell pancakes or chocolate Bakewell tart. My dad loved Bakewell tarts so I'm going to give these a go for his birthday on Sunday! THESE ARE AMAZING. That is all. Wow, Wow, Wow! These look gorgeous Emily! I adore frangipane bakes. I'd go for one (no, make that two, or even three) with the icing topping! Oh my god Emily! These are amazing :D I love the idea of the two different types, although I'm a sucker for a dollop of icing and a glace cherry. These are so cute! I love them. I've got serious bakewell tart cravings now too! Love Bakewell tarts. These would be perfect but one would never be enough!